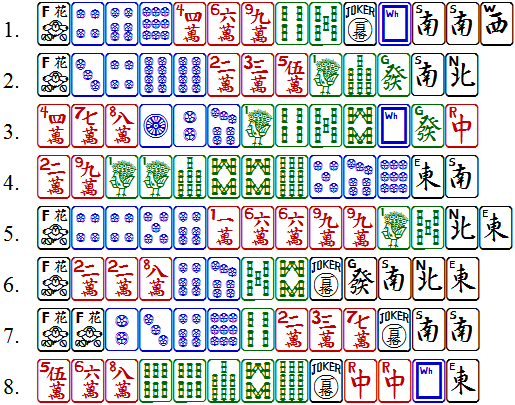 American Mah Jongg (2017 NMJL card). The first challenge with a new card is picking a hand with a random deal. So, here are some random deals. 1. Following the four steps, we see just one pair: Souths. With that soap, we could consider W-D #2, if we had a green or red... The pair isn't working, so proceed to step three: highs vs. lows. There are more highs. And an interesting pattern: six and nine, both in two suits, suggesting a 369 hand. Another interesting pattern: fours in all three suits, suggesting Like Numbers. The numbers seem interesting, and the winds don't. Pass S W 5B. 2. Pair of eights (step 1). Any friends (step 2)? Re Consec., there's just one 7B. Re 2468, there's a 4D and a 2C. Here's a wacky idea: Thirteens #2, 5+8=13 (five tiles). Pass 7B G and a wind (flip a coin). 3. No pairs, so count highs vs. lows (step 3): six lows (including 5B) vs. five highs (including 5B). The lows win, but for laughs, count odds vs. evens (step 4) too: five odds vs. five evens. The dragons needn't go just yet, so pass highs (not including 5B). 4. Pairs of ones and eights; too bad Elevens are so last year! Since the ones and eights aren't friendly with one another, look for friends of ones first (no, hardly any friends), and then the eights (plenty of near-neighbor numbers, namely sevens and nines). Your junk tiles are 2C 1B E S. Choose any three, go for Consec. (the most powerful section of the card). 5. Three pairs: fours, sixes, and nines. No hand can use all three, so see which two pairs are the friendliest. The fours and sixes are a start for Evens (no twos or eights) and for Consec. (couple hands). The fours and nines are friends for Thirteens #1 (and we have F and a 1B (six tiles). The sixes and nines could only combine for 369 (no threes). Go for Thirteens; pass 1C 5B and a wind. 6. Pair of twos. The even numbers are friends with the twos, and Green might work too. The winds and 7D can go (maybe 5B, too). 7. Two pairs: flowers and Souths. The Souths are weak (no friends), so count highs vs. lows: three highs, five lows. Highs can go; pass S 7C 9D. 8. Pairs of sixes and reds. They could go together in Evens, Like Nos., or Consec. #7. Pass E 9B 8C, go for Consec. (the most powerful section of the card). >I also peeked in on your strategy column #669. I only looked at example one, but it's fun so I'm going to do each exercise. I did it without looking at your answer first, and I came up with a completely different scenario! >Key tiles for me were WSS, all three bam dot crak 4's, the bam 5 and crak 6, joker of course. I would pass the dot 69 and crak 9. >1) WSS J (w&d 1) four tiles, safe hand, I have my pair. This is my main safe hand until my pairs fall into place below. Since winds get passed a lot in the Charleston I can anticipate picking up several tiles towards this. >2) W, SS, 4 crak, 4 bam, 4 dot (s&p 1) - six tiles towards it. Don't ask, don't get right? >3) F, 4 bam, white, 4 crak, J (LN1), five tiles towards it. >4) F, 4 bam, 4 crak, 4 dot, J (LN2), five tiles toward it. >6) 4 bam, 4 crak, 4 dot, 5 bam, J. (Consec 6) five tiles towards it. >It would pretty quickly winnow down depending on the passes I get, but there are lots of options here. I wasn't sure you would want the hordes of people who'd join your group as a result of my adding a link. I've now added a link to FAQ 4A. And I'll include a link in future columns about American mah-jongg. Your strategy for problem #1 in column #669 is very interesting. Makes me wonder if I'm coddling my readers when I limit the number of hands to consider, and when I discount hands that have only four tiles when there are five- and six-tile hands. And although I'd follow the high-count hands, you're right that you don't know what's going to come in. I like your thinking re the S&P hand, and your "safe hand" strategy. >I just looked at your column and at the Q&A Bulletin Board but I haven�t seen a comment yet about Question #3. I am wondering why you did not mention the �2017� section as a possibility, #2 in particular (6 tiles) or less likely #3 (5 tiles). I know those hands are missing flowers, but shouldn�t 2017 #2 be considered? To �pass highs� as you suggest could be interpreted as passing the 7D, which would break up 2017. Or is the 2017 section too unlikely because of the missing pair of flowers? What do you think? Deborah, you are so right! I totally overlooked 2017. And you are also right that the absence of flowers is a problem. If only there was one, I wouldn't see it as that much of a problem. But without any, we'll have to pick lucky to get that flower pair. So let's take it the next step: what would you pass instead of just "highs"? >Why would you not save the 5B to try for Consecutive Run #3 which would have 6 tiles toward it? Then pass 1C & both winds? I know it would mean passing two winds to save the 1 bam for the LN hand, but the CR #3 hand seems a worthy goal. That's a good suggestion, Jane! Adding this to column 669. >Thank you for your kind and friendly reply. >Hand #7-two pairs: flowers and Souths. The Souths are weak (no friends), so count highs vs. lows: three highs, five lows. Highs can go; pass S 7C 9D. >Aren't flowers and souths friends? (W-D #5)? Or the idea is to narrow down options. Since this is a concealed hand, might not be worth the trouble. I admit, on first pass I like to see if more winds will come my way. I have much to learn! >Message:	From leslie. Thank,you for all your work. Thanks for the donation, Leslie! As for puzzle 7 in column 669, certainly the Fs and Ss are friends, but they amount to just four tiles. Each player has to come up with her own "strategy rules" (in quotes because they're not really rules, per se). For example, I played with a player who said that she had a "rule" to never go for a W-D hand unless she had at least four flowers in hand. I haven't adopted that strategy myself, but I generally don't target a hand for which I have just four tiles total (as in this case), unless there's absolutely nothing else to go on with my latest collection of lousy tiles. W-D is a fickle family, especially the winds branch; because there are only four winds, one's main opportunity to net some is during the Charleston, when they're commonly let loose. But it's common knowledge among experienced players that winds get passed around, and that sometimes when they get passed, they don't come back (meaning somebody's collecting them). An experienced player who notices that somebody's grabbing up winds will make an effort to stop passing winds* in the second Charleston, if she can help it. And some players who have two winds might hold onto them to see if more come in, or to just thwart wind collection (especially if it's known that one of the other players habitually collects winds). With a flower pair and a wind pair, one could try to pass non-winds and see if any winds come in, but a fallback plan is needed. One could try to observe what's going around while winds aren't, and then pivot to what's trending in the second Charleston--but what if somebody decides to stop? All in all, I prefer Consecutive Runs. *Sorry for the double entendre, but (1) I haven't found a better way of saying it, and (2) it never stops tickling my funny bone. > Column #669, hand #7 It helped me to set my tiles in a rack and I decided that I would try FF 3 6 9 dots + joker, trying for a 369 hand and keep the 3 crack in case it became 3 suits. Thanks, I enjoyed playing your random deals! Hi, Mary! I'm glad you enjoy that type of column. Identifying a hand to target is just the prelude to the actual problem: what 3 tiles to pass. You wouldn't pass the same 3 tiles I said I would, so what 3 tiles would you pass? Need rules for American mah-jongg? Tom Sloper's book, The Red Dragon & The West Wind, is the most comprehensive book about the American game, including official rules not in the official rulebook. AND see FAQ 19 for fine points of the American rules (and commonly misunderstood rules). AND get the official rulebook from the NMJL (see FAQ 3).